Vikki Murphy is a graduate of Andrews University in Berrien Springs, Michigan, with her undergraduate degree in communications, emphasis public relations. Her background is in marketing and public relations. Her first job out of college was as the assistant administrator of Lakeview Hospital in California, where she worked closely with members of the community to obtain funding for a new medical facility. She was also the youngest person and first female to hold the position of Director of Marketing for CableData, Inc. in Sacramento, California. Vikki has been a member of the David Wilson organization for over thirty years, beginning when their only dealership was Toyota of Orange. Since that time the organization has expanded to include over 2,000 employees and 17 dealerships throughout Southern California, Arizona, Nevada and Mexico. In addition to her business responsibilities, Vikki enjoys working with local church, civic and charity groups. She recently served as Chairman of the Board of the Orange Chamber of Commerce, and President of the Professional Auxiliary of the Assistance League of Orange. She also serves on the Foundation Board for Santiago Canyon College. 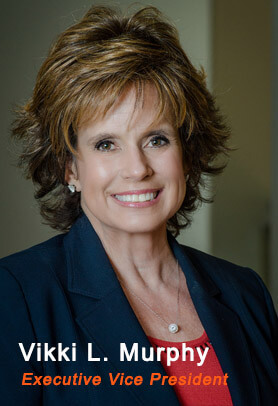 Her most recent appointment is to the Board of Directors of Orangewood Children’s Foundation, an organization dedicated to serving the abused and abandoned children of Orange County. Vikki has received numerous business and civic awards for her achievements and contributions to the community. She and her husband Mark were honored with the Community Legacy Award for their service and dedication to the City of Orange. Vikki was named Outstanding Business Woman of the Year in 2001 by the American Business Women's Association; and received the prestigious "Good Scout" award from the Boy Scouts of America for her contributions and dedication to scouting, her community and her country. In 2007 she was named one of Chapman University's "Phenomenal Women" and was also nominated for the Athena Award, given to women who demonstrate excellence, creativity and initiative in their business or profession and provide outstanding service to their community. In 2004, Vikki was honored to have been selected as the City of Orange's "Citizen of the Year;” and in 2015 she was named “Community Champion” by the Community Foundation of Orange for her commitment to enhancing the quality of life for the children and citizens of Orange." Vikki writes extensively, has had articles published in numerous magazines and journals, and also has two books published by Pacific Press Publishing Co. She is currently working on a third entitled "Brooksong."